See ad agency 'Murphy + Kennedy' pitch cringe-worthy ideas that may hit a little too close to home. If an unknown lumber company from Pittsburgh can hijack the Super Bowl with a political statement, why not Cheetos? One week after 84 Lumber, as well as Budweiser and Audi, used Super Bowl LI to air commercials that touched on hot-button social issues, Saturday Night Live took the trend to its logical extreme: a pitch meeting in which an ad agency proposes outlandishly political concepts for a commercial about puffed cheese snacks. 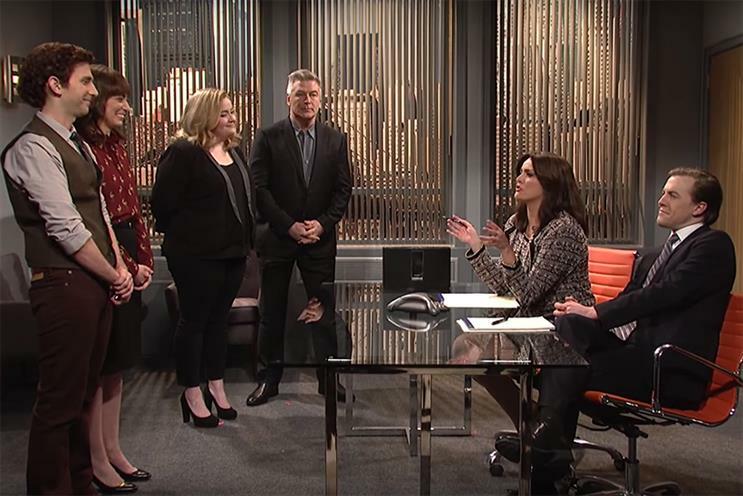 The sketch was given prime placement in Saturday’s show, directly after the first commercial break. And while it might not have gotten as much day-after buzz as Melissa McCarthy’s reprise appearance as White House Press Secretary Sean "Spicy" Spicer, or the absurdist fantasy of Leslie Jones playing President Donald J. Trump himself, it did elicit some positive reaction on Twitter. Watch the full sketch below.